Posted in Silent Sunday on 27/07/2014 by mummyglitzer. Brilliant!! My kids have almost become to 'old' to have fun doing daft things like this, I miss it!!! Ha ha - love it! If he had done it before last night it would have been! Typical. Love it! I'm not sure boys ever grow out ofdaft things like that -I recently took a photo of my 25year old brother doing the same thing! Love it lol. I have a picture of me inside a big flower pot when I was little lol. Have a lovely sunday and hope the flower pot has been removed now ! 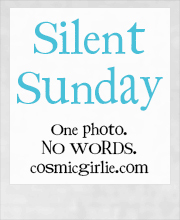 Kim Carberry recently posted..Silent Sunday!! Haha, I love happy kids. I'd try to this but but I'd never come out, hah. Happy Sunday! Is this the new way of keeping cool in the heat? I think it might be you know! Has he been helping in the garden? We don't even have a garden; I think my husband is planning some indoor plants despite the fact we manage to kill them whenever we have any. But who knows what his thought process is?! Love it - made me chuckle. Is a new version of the darth vader mask? Finally, you don't need to spend a fortune in costume. Love it! Lol that did make me giggle. What is it with putting plant pots and boxes on heads?